The argument seems to have gone circular. Earlier Austrokiwi's coin was, according to your citeria, distorted, now it's not. Wikipedia's lay person's version of what distortion means, relies on "what would be expected". We know better. We all know that changing the lens does not cause distortion. The perspective is exactly the same, if you stay put. Moving the photographer changes the perspective, it does not distort the image. (Too many things have been "got wrong", here ). If you remove the frame of reference and just present the trapezoidal window, it’s not natural, it’s distorted. But according to you it’s the natural view and using perspective control tools to make it square is distorting it. I believe I (we?) do “get” what you’re saying, but I think you’re wrong, in that you’re over simplifying, to an imaginary construct. And, I say again, I do not see any first order versus second order effect, unless you can show some maths? There are some interesting questions in this discussion about natural view, distortion and perspective. While we are visualy aware of some shapes in a very wide angle of view (almost a hemishere) we only see sharp details in a very limited view of field. To see everything clearly we move our head around and add all the details together in our brain. If we should draw a precise picture of all these impressions we could draw the details on the inside of a transparent hemispere exactly as we see them when wee look in different directions. But if we want to make a flat picure we must choose some kind af projection. When we look out from the center of our drawing globe all lines are straight, and the windows just in front of us have right angled corners, but when we look at the flat projection all lines are curved and the windows look like pillows. This is not the result of “fish eye lens distortion”. It is the result of mixing plane geometry with spherical geometry. If you project af picture from a fish eye lens onto the inner surface af a globe you will get a beautiful picture. Have you ever seen a wide angle film in a planetarium? That is without any distortion. But only if you have a seat in the exact center of the globe and move your head around. The geometrical difficulties are diminished when you choose to look at a tiny fraction of a hemisphere. If this fraction is small enough the picture on the curved surface looks almost identical to a picture on a flat piece of paper or a flat sensor in a camera or the little focus point in our retina. And we don’t notice the curved lines and the odd perspective. But they are still there. I don’t know if this makes the discussion simpler or more complex. But for me it makes it easier to understand. The argument seems to have gone circular. Earlier Austrokiwi's coin was, according to your citeria, distorted, now it's not. The natural image of the coin taken according to the left configuration in my last diagram shows an image of the coin that appears distorted vs the desired/expected straight-on view. The shifted image of the coin taken according to the right configuration in my last diagram shows an image of the coin that appears with minimal distortion, but to achieve this appearance, the natural image was distorted in such a way that the coin no longer appears distorted. We all know that changing the lens does not cause distortion. Sorry but this is just not true. Different focal lengths affect the way that objects look in their respective images. Direct comparison of images will show that the two images are distorted versions of each other. Very good points, and certainly does help explain the "natural" view. Standard analysis and examples agree with ChrisR on this point. If you shoot the same scene, from the same viewpoint, with the same camera orientation, using two rectilinear lenses having different focal lengths but the same diameter entrance pupils, then the wide-angle image can be cropped and enlarged to exactly match the narrow-angle image. Ray, if what you've written is what you really mean (that is, it's not a typo), then you'll need to show us some examples of what you're talking about. At this moment, the words look like just a glaring error caused by some misconception. Ray you appear to be confused, essentially digging the hole deeper, so all I can do is try to be more methodical - though it's repetitious. It follows from Rik's explanation, that the Wikipedia text is also a "glaring error". I'm calling it the layman's error - and we aren't lay people, because we can draw triangles! Either a simple mathematical explanation is correct, or a rather vague idea about what looks acceptable and therefore "natural" is correct. You can't have it both ways, declaring one to be distorted and the other not, as the mood takes. As soon as you project a 3D image onto a 2D plane, whatever the angle of that plane to some vaguely positioned middle ray, including the 90º case, the image is a distortion from the vague notion of naturalness. If you point the camera up at a window, you're saying that's "the" natural view. 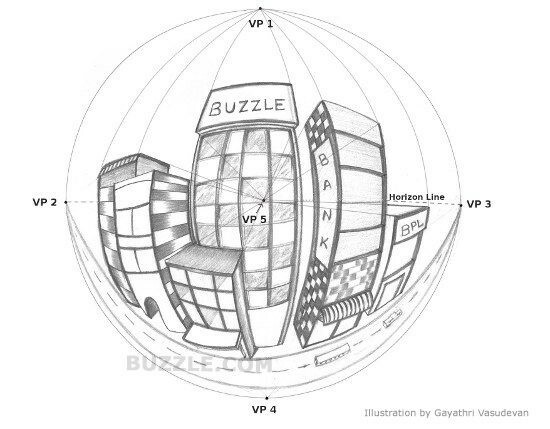 But if you point the camera at each of the four corners you get four different views. The higher the window, the more different they are. It is not a First /Second order effect, it's a continuum. Is Austokiwi's coin, slightly offset, either distorted or not, according to the vague "naturalness" notion? If the coin had been 3 times the diameter , would the section of the coin have become "unnaturally distorted" by cutting it out from a larger sensor's view? One can try to make a Natural view a less unreasonable concept by consideration of the "frame of reference" of the picture, as I wrote above, but it immediately gets difficult. So - are you saying that all views are distorted, or that your own particular idea of natural is OK and everyone else's is distorted? The former is not really saying anything (one could equally say none are distorted), and the latter, we couldn't all possibly agree on. "the natural image was distorted in such a way that the coin no longer appears distorted. " There is no definable Natural Image except one that "looks ok to you" so you're saying that changing an image is distorting it - which again, isn't saying much. "Changing" the image I will accept, but "distorting it" in this way, is not a term I will accept, because it has a pejorative connotation which isn't appropriate. It's therefore, to me, a mistake and incorrect. Troels has illustrated the sphere I referred to above. The mention of the eyeball's curved surface is tempting but that sphere is of course not the same as the sphere we're talking about. It reminds us however, that the camera in incapable of producing a "natural view" because it uses a flat 2d projection. The "natural" view does not actually occur anywhere - other than as a crude notion in an artificial and problematic mental construct. Although I've invoked landscape photography as a method of helping explain things, the focus of this thread is coin photography, thus I was assuming same magnification. This is also the same assumption made in the wiki article that is so disparaged here. You of course can't have a perspective distortion if you don't change your perspective! When I cut and pasted I accidentally left out ChrisR's second statement "The perspective is exactly the same, if you stay put". Sorry about that. But this was just a digression. Precisely and well-put. Each of the different views is a natural view. It is what you see if you look straight-on at the different corners of the window. From a photographic perspective, if you used a normal lens, pointing it at the four corners, you would get four different "natural" images, all with slightly different perspectives on the subject of the window. The natural view of the offset coin is not round, thus you could say that it appears distorted. If parts of the coin are outside the field of view, then you simply can't see them. I don't see the mess here. "Natural Image": An image taken with a normal lens looking straight-on to the subject. The image is "natural" because it has similar appearance to the "natural view" defined above, when the image is taken from the same vantage point. edited to add: I included the normal lens in definition since it approximately matches the useable field of view of the eye. However, given the earlier arguments, you could use any focal length lens to take the image, and crop appropriately, while still ending up with a natural image. I suppose even this needs qualifying, since if you use a lens longer than normal, the field of view will be restricted and the image will be just the center part of the natural image. Hopefully you will follow my logic above, and definitions, and realize that there is indeed a "natural view" as well as "natural image" that can be taken of it. It seems that terminology bias has come into play here. The word "natural" has deep cultural meaning. If I had simply used the word "straight" or perhaps "straight-on" there may have been less controversy. Similarly, the word "distortion" has deep meaning that has "pejorative connotation". Yet perspective distortion is indeed an appropriate and accurate way of describing the "change" in the image that occurs due to changing of perspective. Again, this is surprisingly controversial for something that has been accepted wisdom for over 150 years. Ray - to me there is a distinct lack of logic in what you're saying. You're now saying there's any number of natural views? How is that worthwhile? To me this is repeating and adding to earlier errors and muddle. Questions have remained unanswered, so I'll leave it there. Thw Wikipedia article, appears to have been written by the "Creative" person trying to sell the one book which it cites. It's full of errors. There's nothing new about some people getting things wrong, over and over - it's been happening for a lot more than 150 years. Chris...I don't understand the issue you are having with this. If you look at something, you are exemplifying a natural view. Look at something else, it's a different natural view. Looking at the center of a window is a different natural view than looking at the corner of the window. I realize that wiki pages are not always the best references, but I assume you are not contending with the basic concept of perspective distortion. So what is the problem? If you look at something, you are exemplifying a natural view. What I see is not the same that a camera records. I only look at one spot at a time. A camera projects an image onto a flat plane of unspecified size. AND the word "natural" adds nothing. basic concept of perspective distortion. is a mistake. "It looks funny", depending on the distance from which you view the image, so those who don't understand, call it distortion. It's simply the view from a different place. No camera image is distorted - or all are distorted. .. as I believe, Rik, Troels, and Ed have also said. The word "distorted" is misappropriated and thrown around in a vague way. Inconsistencies are ignored, and an attempt is made to fudge, in terms of first and second orders - which don't apply here. Replace "distorted" with "different", and forget about "natural", then I don't have a problem. I just knew that this would come down to semantics! I care not what you call it. As long as you agree that the straight-on view can be stretched in a certain way as to make it look like the shifted view, then we're good. Let me approach this from a different angle -- one that may add insight for other readers also. The picture shown by Troels is not correct. In fact, the flat picture needed for Troels' use is exactly the one produced by Ray's standard camera. 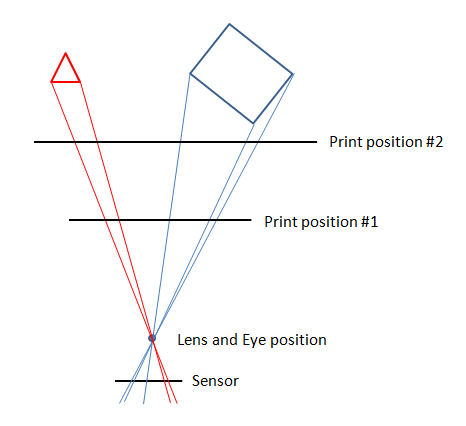 When the viewer's eye is positioned relative to the print in exactly the same way that the lens entrance pupil was positioned relative to the sensor, then as the viewer rotates his eye to focus on different parts of the print, he will see exactly the same shapes from the print that he would see from the world when looking at the world directly. If you're having trouble with this concept, consider the following sketch and imagine that the thin lines are rays of light. When the picture is taken, rays of light coming from the world go through the lens to create an image on the sensor. After the print is made, and placed in the proper position with respect to the eye, rays of light come from the print and go through the eye's pupil to form an image on the retina. The rays of light take the same paths in both cases, so the viewer sees the same view of the world in both cases -- either directly from the world, or indirectly through the intermediates of the sensor and print. If you want to make the equivalent of a full sphere surrounding the viewer, then all that's required is to surround him with multiple planar faces, each corresponding to pointing the camera in a different direction. A common example is the "cubic panorama", which can be easily created with a wideangle lens by shooting up/down/north/south/east/west and assembling the prints into a cube sized to make features line up properly at the edges. But there is nothing special about a cube. Any number of faces can be used, surrounding the viewer in whatever arrangement you like. The requirement is only that each print be positioned so as to match the corresponding sensor position. At this point, I can practically hear Ray saying "Great!! Rik agrees with me!!" Alas, my friend, that is not the end of this story. The thing is, this wonderful property of accurately matching the world with a planar image does not depend on the sensor being perpendicular to the optical axis of the lens. If you apply similar triangles and think about this for a while, you should reach the conclusion that these new sensor and print positions work just as well as the first ones did. At that point, I ask, rhetorically, What is it that's really special about Ray's "natural configuration" for the camera? The answer is, It's the only one that corresponds to viewing the print from an eye position located perpendicular to the center of the print. 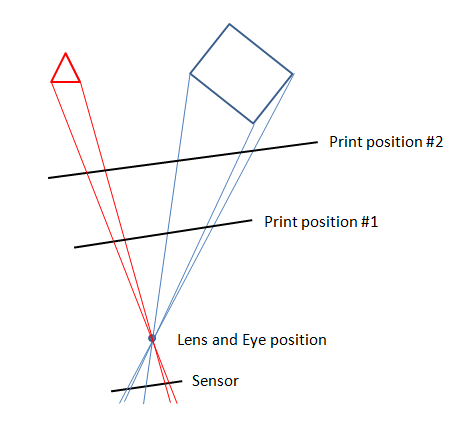 That's because the lens position was located perpendicular to the center of the sensor, and the eye position has to correspond with that in order for the geometry to work out right. So, from my standpoint, a good case can be made for calling the usual camera configuration "natural", if we also agree that it's natural to view prints face on and centered. I have no great problem with that. What I do have a problem with, is Ray's habit of asserting that one or another thing is "distorted", without ever saying clearly what he means by that word. I say that carefully -- "what he means" - because it's very common for different people to use the same word to mean different things. As far as I can tell, that's exactly what is happening here. Ray apparently asserts that all images are distorted unless they were shot with his standard camera configuration. The rest of us strongly disagree with that, because we have a different definition of what "distorted" means. To us, an image can also be considered not distorted if shapes in the plane of focus are preserved in the focused image. That happens whenever the focus plane, the sensor plane, and the lens plane are all parallel -- notably, in the shifted configuration. So, from my standpoint what's really being debated is what it means to be "distorted". Ray's definition seems too narrow to the rest of us, and I guess that ours seems too broad to Ray. There may also be misunderstandings about how the geometry works, but I don't think that's a key issue. As long as you agree that the straight-on view can be stretched in a certain way as to make it look like the shifted view, then we're good. No -- I don't think that agreeing on that point addresses the conflict at all. I certainly agree that it's possible to stretch the straight-on view so as to make it look like the shifted view. And if you actually do that, say using Photoshop or a tilt/shift enlarger, then I also agree that you have distorted the image that came out of the camera. But that's very different from saying that the resulting image is distorted when considered by itself. In my view, if somebody sets up the camera to shoot the shifted view, skipping the other view altogether, then I'd just call that "getting it right the first time". Shooting with shift, in this interpretation, is a way of setting up the camera to avoid distortion in the first place, as opposed to shooting in the other configuration and then having to undo the effects of perspective that were introduced by doing that. Yes, this is a matter of semantics. But if you look up the definition of "semantics", you'll find "the branch of linguistics and logic concerned with meaning." Semantics is meaning, and meaning is what I care about. Bring on the semantics! Bottom line, I will not agree that shifting the lens introduces distortion, as Ray asserted in the beginning. Not at all! There is no "straight on view" versus "shifted" view. With a flat image plane, all except one central pixel is shifted. That pixel may or may not be part of the image you wnat. I agree that you can take a shape and stretch it into a different shape. Otherwise, no I don't agree. a good case can be made for calling the usual camera configuration "natural", if we also agree that it's natural to view prints face on and centered. --I don't think the camera & eye have to be centered, as long as the eye is on the line perpendicular to the same spot in the print that the camera axis was perpendicular to in the scene. So to have a "natural " shot you have to know what's going to be done to the print - how big it will be, how high it will be on a wall, and how far away the observer will be. Also, it means that ALL photographs are a "natural views" as long as you stand in the right place when looking at the print. The image you capture, by itself, doesn't have a property of naturalness. This is the same issue illustrators have - I did it in "Art" when I was a lad. "Where is your viewer going to be"
Yes, I alluded to this earlier. To make a natural image look like the corresponding natural view, you must consider size and distance to the print. But I like that you've taken it one step further...you can "create" the appearance of a natural view by adjusting the way you look at a print. I think this further grounds both concepts. This discussion has been good, and I think we're very close to agreement on the salient points. I'd like to step back to the root of the thread, going back even further than the OP, to see if it helps close any gaps. In full-coin photography, the desire is to reproduce the "in-hand look" of the coin. This look is created by viewing the coin straight-on, with lighting that illuminates the coin surface well enough to see color and details. Usually this involves pseudo-axial illumination, ie tilting the coin slightly such that an overhead light reflects off the coin surface and brightly illuminates the coin, but unfortunately this is a difficult lighting style to achieve when photographing the coin to attempt reproduction of the in-hand look. You can tilt the coin such that a slightly off-axis light reflects directly off the coin, but this causes depth of field issues, and slightly distorts the shape of the coin into an oval, which folks don't like to see in an image, even if that is what they really see in the in-hand look! Giving an oval-distorted image to a client won't give a pro photog much repeat business. Stretching the coin shape in Photoshop, and using focus stacking, can solve the oval distortion and the depth of field problems, but the added workflow is not generally acceptable. A longer lens, allowing more working distance and thus less required tilt, is the usual solution for the pros, but hobbyists often attempt other solutions. The specific solution addressed in this thread is to move the coin off-axis rather than tilting it. This moves the coin away from the camera such that lighting is easier to apply. Pointing the camera at the coin results in the same tilted view as the on-axis tilt technique, so shifting the lens is required to bring the coin back to a flat and undistorted view. A similar result could be achieved through focus stacking and stretching in Photoshop, but the optical technique is much preferred from a workflow perspective. So, you can either stretch the image of the coin in Photoshop, or apply shift, to modify the appearance of the coin from the undesired oval shape to the more acceptable round. One method achieves this digitally, while the other achieves it optically, but both methods change the apparent shape vs the way the coin looks when viewed without modification. to make it look right, just deal with it. Make the round coin round. Keep sensor and coin parallel or correct in post. No need to think about "natural" view.